This microsite shows you which big-name artists have your trend-spotting talents to thank for their stardom. 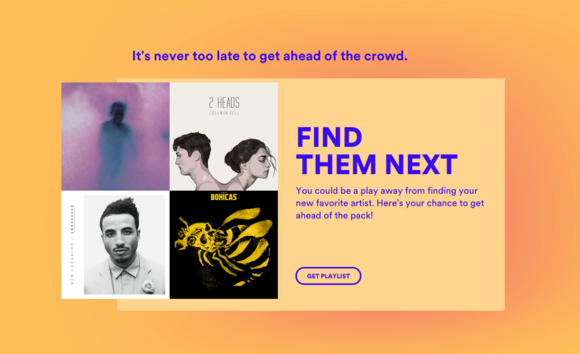 The Found Them First tool—which is its own site, but powered by Spotify—is available to both free and premium Spotify subscribers. It allows you to establish beyond all doubt something you have probably suspected all along: That your fine eye for talent has an uncanny knack of spotting future music superstars before everyone else. Found Them First tells you the bands you were listening to before they were cool. Major bragging rights. It’s fairly simple to use. All you need to do is log in with your Spotify credentials and wait for the app to weave its big-data magic on your listening history. It will then present you with a list of artists who count you among the first 15 percent of their Spotify listeners, and have more than 20 million streams against their name with a growth rate of more than 2000 percent between January 2013 and June 2015. 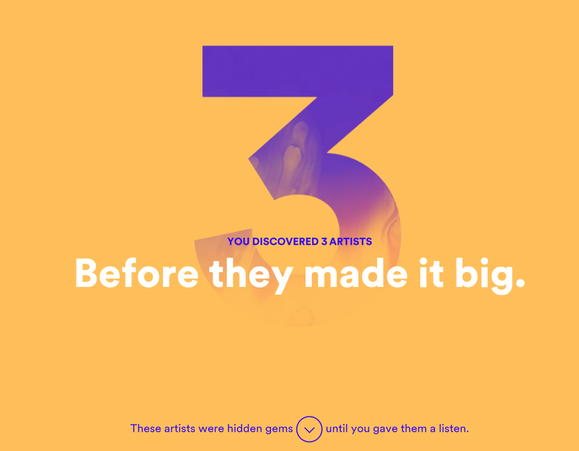 It also gives you the date on which you first listened to a certain artist and exactly what percentage of their listeners you beat to the punch in doing so. That’s not all, though. The site even lets you share a playlist of all such artists with your friends while presenting you with a separate playlist of little-known musicians that it believes deserve your attention. The tool also gives you a customized playlist of other little-known artists to listen to. Why this matters: File this one under the “another-one-of-those-fun-though-not-super-essential-Spotify-features” category. There have been quite a few of these in recent times, including Taste Rewind, Sweet Spot, and Spotify Running. While these tools may not amount to much on their own, together they make for a pretty unique experience. And if Spotify wants to stay competitive as Apple Music’s free trial period comes to an end, the company will have to think of new, innovative features for their users to keep them on board.